SmartChord is an application developed for professional musicians as well as budding artists. It has a lot of tools that can help a musician greatly. SmartChord is an Android application developed by smart Music Lab. Read on to know more about this amazing application. If you are a musician SmartChord is a must have Android application for you. It can help you in most of the aspects of your musical life. It has developed by smart Music Lab. It requires Android version 2.1 and above and the latest version as of now is V3.5. The best thing that I like about this application is that it is pretty small considering the number of features that it offers. It is just about 3.0 MB in size. It has got a plethora of useful tools that can be pretty handy and time-saving for all the musicians out there. Most of the tools are inclined towards a guitarist, but all other musicians can also benefit a lot from this amazing application. So, without any delay let's get started with the features of SmartChord. 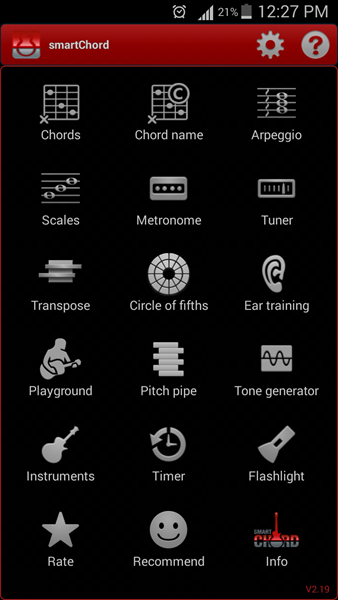 The following are the features that SmartChord application offers for the musicians. Chords are the most essential parts of a musical performance. There is an option in SmartChord called Chords which when selected you go to a screen where you can select a Chord and all the variations of the chord to be played on the guitar is shown below. On the left side you have to select the Root (from C to B) and in the middle select the type of the Chord and on the right side, you can select where should the bass be. When you touch on each of the chord display shown below you can hear how each on sounds. There is also an option for Capo (which is used to transpose the scale in a guitar). Capo can be set till the 10th fret on the guitar. With this option you can get to know which notes are present in a chord. You can select the chord you want and all the notes in the chord are displayed on the frets of the guitar in red and yellow dots. When you touch on each dot you can hear how it sounds right there. You can also select the range of the frets below by dragging the bar. When you select scales option a screen opens where above you have the staff notation and below the frets view of the guitar. You can select the chord and the scale (like Major, Chromatic, Dorian and many more) and the notes in the scale are displayed on frets as well as the staff notation. Metronome is also a really important tool for musicians. Metronome helps to know the tempo (speed) of a song in beats per minute (BPM). You can change the tempo by touching and dragging on the tempo bar. There is also an option to change the measure of your beat like 4/4, 6/8 and more. You can also set the tempo by tapping to the tempo you want on the Tap tempo button. You can also set the timer for how long the metronome should run. There is also a tuner for guitarists and others such instruments in this application. You can select the instrument that you want to tune and the settings will be changed accordingly. Apart from that you can also change the default tuning setting from E,A,D,G,B,E (which is the standard tuning) to any custom tuning setting that you want. Sometimes custom tuning is essential for guitarists for different reasons. Ear training can be a great tool for musicians as well as singers. In this tool you can select some chords that you want to train your ear to. Now when you touch the Start button a chord is played and you have to recognize which chord it is and select the right one accordingly. You can later add more chords and practice each chord. There is also a button called Statistics which displays how well are you doing in ear training. When you open the transpose tool you can set how much transpose you want. You can then see which chord will be played instead of a particular chord when you set the transpose to some value. This can also be pretty handy for most musicians. As a musician myself, I am greatly impressed with the amount of tools that this application provides for musicians. Even those who are getting started with music can use this application to improve their skills in a structured manner. There are also some more tools available in the application which I have left for you to explore. So, if you are a musician or, at least interested in learning music go ahead, download and install this application right away. No need to think twice. Happy musical life.